I don't know about you, but I can't believe we already went through a whole quarter of 2019. I really haven't seen the time pass at all this year. Between my mom visiting for a month an a half, the usual social obligations that comes with having a child, launching my Etsy shop, and creating new work and hosting classes and workshops, I don't think there's been a quiet day in weeks. And now, before I know it, I find myself at the beginning of April, contemplating weeks of heat, sweating and begging for the monsoon to come deliver us quickly. Because while we were blessed with a super pleasant and relatively long Winter this year, the heat hit us with a vengeance in the last week of March. There is something quite surreal about going one day not even needing the fan during the day to turning everything at full speed and sleep with the AC the next day. With a new month starting, this is also time for you guys to go download this month's calendar page if you haven't downloaded the full 12 months perviously. April in my mind is ALWAY a bright yellow and white bokeh, so I used this color palette to create this Art Nouveau inspired illustration. Like all the other calendar illustrations I have done, it's up for sale in my Society6 shop, and it exist in two versions, one with the month, one without. 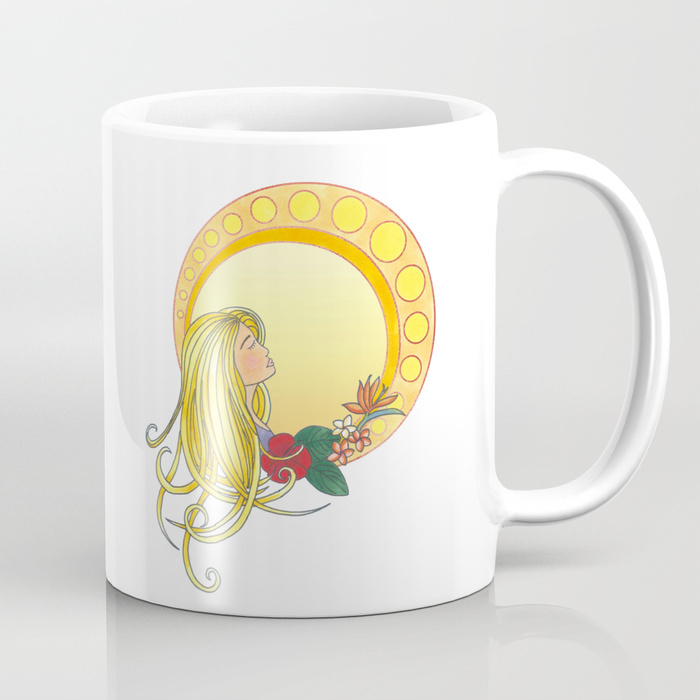 The artwork without the month's name goes under the title " Gold lady " and is available on pretty much everything Society6 has to offer (and their range is getting bigger and bigger), like the coffee mug above. I don't know about you, but if you live in a tropical area, having a sunkissed lady surrounded by tropical flowers is really an apt illustration for April right? 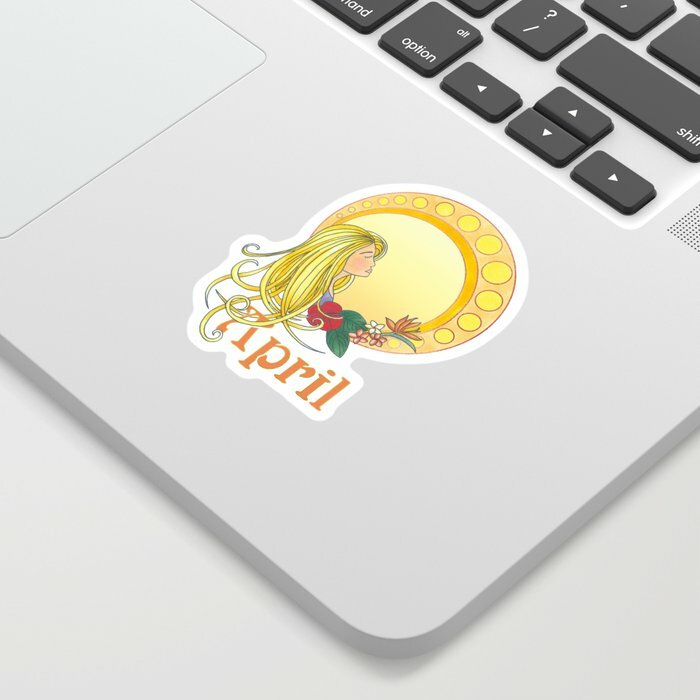 Right after I was done uploading all my "monthless" illustration I got this idea to offer a month-specific version as well, because some people like decorating their bullet journal with stickers, and that seemed like something that really could complement my Free printable calendar. 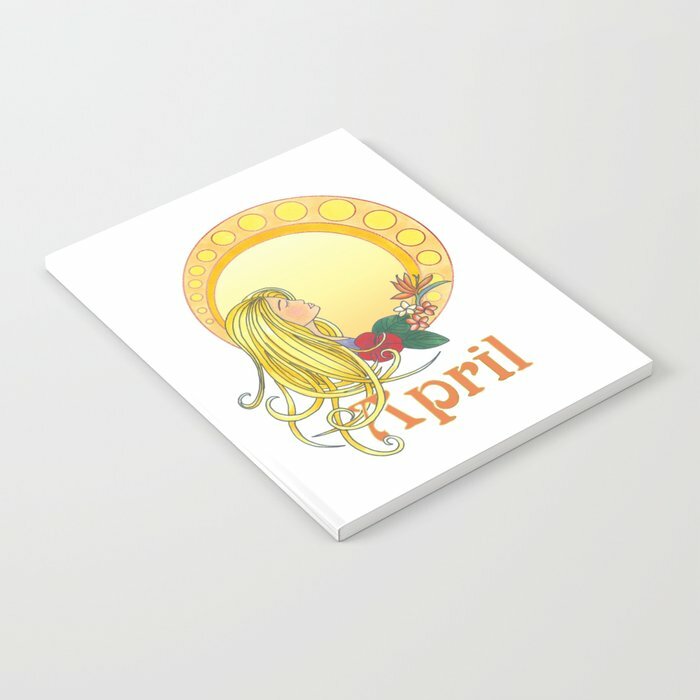 This one goes by the name of "Lady April" and like all the others is available only on specific products, namely the ones like the sticker above, or the notebook below, along with other items that would make great birthday gifts for someone born in April. Now that we are in April, I'm realising I should start thinking about how I want to go about my 2020 Calendar, I need a theme, and I need to start thinking what kind of illustrations and layout I want to go for. 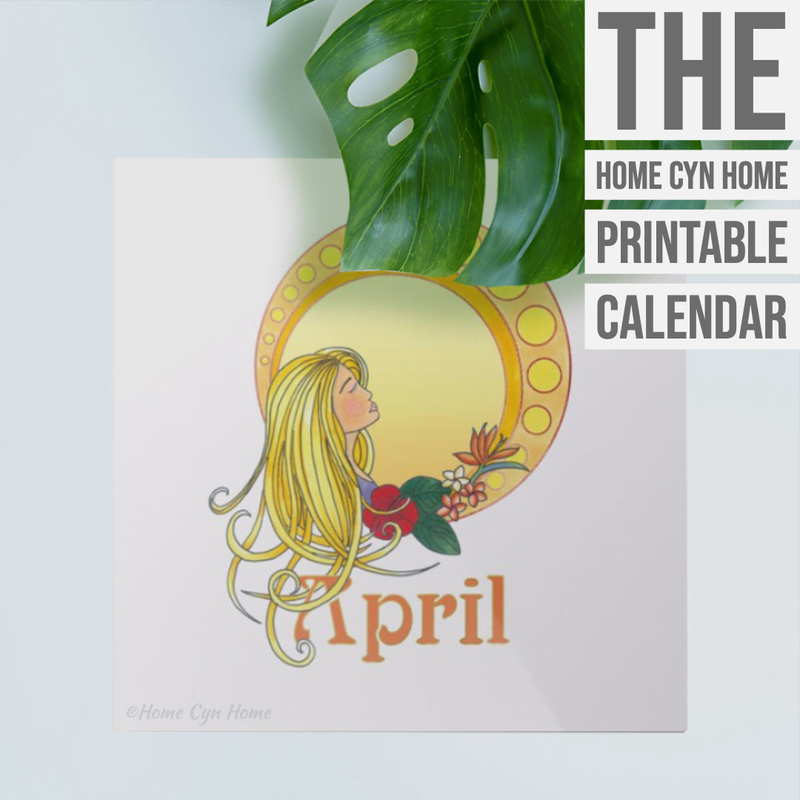 How many of you actually download and print the calendar and use it? And, is the layout and design working for you?